Pictured are: Back Row – Members of Council Douglas Haynam, Patrick Richardson, Mark Frye and Mark Luetke. Front row – Katie Cappellini, President of Council Mary Westphal and Member of Council Sandy Husman. We are your elected voices in city government. We’re here to represent you and your concerns regarding our city and its future. We answer to you. Contact us anytime you have a comment, question or concern. Click on any link below and it will take you to that topic. Can’t find what you’re looking for? Use the search tool on this page, or call us. We’re here to help. It determines the organizational structure of City government. It approves or disapproves appointments or removals of appointive officers, and heads of departments or divisions of the City. It establishes the number of city employees and sets their qualifications and compensation. It determines the methods and procedures used for making and awarding City contracts. It sets the method, manner, consideration, and procedure used for the purchase or sale of property on behalf of the City. It has the power to expel any member of Council, the Mayor, or the Clerk-Auditor for gross misconduct, malfeasance, misfeasance, or nonfeasance in office, for disqualification from holding office, for violation of the oath of office, or for conviction while in office of a crime involving moral turpitude. It also has the power to make such other general regulations as the Council may deem necessary in the public interest. Council meets on the first and third Mondays of each month, unless the scheduled date falls on a holiday, in which case it meets on the following Wednesday. Council sessions are recorded, and minutes are kept by the Clerk of Council. I have been a resident of Sylvania since 2003. I have one son in college and a daughter that attends Sylvania Northview High School. Before my appointment to City Council, I served as a member of the Sylvania Municipal Planning Commission. I also serve on the Lucas Board of Developmental Disabilities. I am a 1985 graduate of the Pennsylvania State University – Capitol College and have been a Business Executive and Energy Consultant for the past 20 years. I serve on the following committees: Finance, Safety (as chair), Streets, Utilities & Environment and buildings and grounds. I was elected to City Council in 2017 at the age of 26. I am a lifelong resident of Sylvania and a graduate of Sylvania Northview High School and the University of Toledo. At UT, I was the Chairman of the College of Republicans and the Drum Major of the Rocket Marching Band. I am also an Eagle Scout with Sylvania Troop 154 and I work as a trader for Kripke Enterprises in Toledo. Please do not hesitate to call, text, or email me with questions or concerns. It is an honor to serve the great people of Sylvania. I serve on these committees: Buildings & Grounds, Employee and Community Relations, Parks & Forestry, Streets (as chair) and Utilities & Environment. I am in my third term on City Council. I am currently on the board of the Sylvania Area Joint Recreation District, a member of the Downtown Sylvania Association on the Sylvania Fall Festival committee and the ‘Ridin Late in County 48’ planning committee. My husband, Tom, our 2 children and I have been residents of the city of Sylvania for over 15 years. My son graduated from Northview High school and my daughter is a senior. I graduated from Northwestern University and have experience as a corporate executive as well as a small business owner. I serve on these council committees: Parks and Forestry (as chair), Zoning & Annexation, Buildings and Grounds, Employee & Community Relations and its Economic Development Sub-committee. This is my fourth term on City Council. Before my election to Council, I served as a member of the Municipal Planning Commission from 2002 – 2004. Currently, I serve on Council’s Finance, Streets, Parks & Forestry, and Safety Committees and as chair of the Zoning & Annexation Committee. After graduating from Miami University with a BS in business and the Ohio State University College of Law, I began my private practice of law. Today, I am a partner in the law firm of Shumaker, Loop & Kendrick. I am a Board Member and Trustee for the Erie Shores Council of the Boy Scouts of America and have been involved in many community organizations and activities during the 30 years I’ve lived in Sylvania. I have been a resident of the City of Sylvania since 1978. I was appointed in September 2010 to fill a vacancy on Sylvania City Council. I was elected to a four-year term that began January1, 2012. I served on the Sylvania Planning Commission and the Board of Architectural Review for four years and chaired both boards for two years before joining Council. I am on the board of the Sylvania Community Action Team (S.C.A.T. ), a Sylvania Historical Village Trustee and a member of the Sylvania Chamber of Commerce. My husband John and I have two married daughters who attended Sylvania Public Schools and eight grandchildren. I serve on the following committees: Buildings and Grounds (chair); Parks & Forestry; Utilities & Environment; Employee & Community Relations and its Economic Development Sub-committee; and Zoning & Annexation. I am in my fourth term on City Council, having previously served as a member of the Sylvania Board of Education for four years. I am a member of the Sylvania Sister City Commission, serve as vice chair of the University of Toledo Foundation, and am a trustee of the Toledo Public Schools Foundation. My wife Sandy and I have been residents of Sylvania for more than 30 years and raised our two daughters here. I serve on these council committees: Employee & Community Relations (as chair) and its Economic Development Sub-committee; Finance, Safety and Zoning & Annexation. I grew up in Sylvania, part of my family’s third generation of Sylvania natives. My parents still live here in the home I grew up in, built by my parents in the 1950s. After serving on the Municipal Planning Commission(beginning in 2007) and many years in the communications/public relations arena, I was appointed to fill the seat vacated when Dr. Read Backus retired from council in August 2008. I am currently the Executive Director of the Northwest Ohio Affiliate of the Susan G. Komen for the Cure Foundation. I serve as Council President (Elected on 7/16/12) and on these committees: Finance (as chair), Safety, Streets, and Utilities & Environment (as chair). The Building & Grounds committee is responsible for legislative action relating to city buildings, parking lots and other properties owned by the city. The following council members are on the Building & Grounds committee: Patrick Richardson, Katie Cappellini, Mark Frye and Sandy Husman (chair). The Employee & Community Relations committee is responsible for legislative action relating to the city’s employees and the community at large. It reviews the terms and conditions of employment of city workers and collective bargaining agreements negotiated with city employees. The following council members are on the Employee & Community Relations committee: Patrick Richardson, Katie Cappellini, Sandy Husman, and Mark Luetke (chair). The Finance committee reviews all legislation and matters affecting the financial status of the City of Sylvania, including the preparation of the annual operating budget and the annual tax budget. The Finance committee also reviews investment policies and banking decisions. The operations of the finance department and income tax office also fall under the scope of the Finance committee. The following council members are on the Finance committee: Mary Westphal (chair), Doug Haynam, Mark Luetke and Mark Frye. The Parks & Forestry committee is responsible for legislative action relating to city parks and trees. It is also responsible for legislative activity relating to Plummer Pool and Centennial Terrace & Quarry. The following council members are on the Parks & Forestry committee: Katie Cappellini (chair), Doug Haynam, Sandy Husman, and Patrick Richardson. The Safety committee is responsible for legislative action relating to criminal ordinances and the operation of the Police Division. The following council members are on the Safety committee: Mark Luetke, Doug Haynam, Mary Westphal and Mark Frye (chair). The Streets committee is responsible for legislative action relating to streets. The following council members are on the Streets committee: Doug Haynam, Mark Frye, Mary Westphal and Patrick Richardson (chair). The Utilities & Environment committee is responsible for legislative action relating to utilities, including water, electric, gas, garbage collection and recycling. The following council members are on the Utilities & Environment committee: Patrick Richardson, Mark Frye, Sandy Husman, and Mary Westphal (chair). 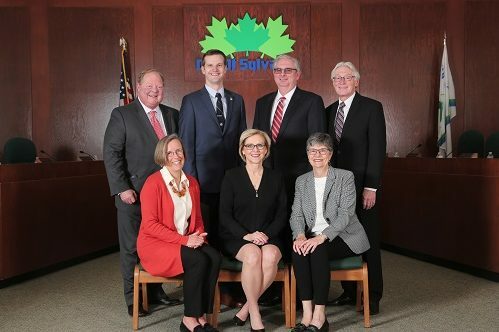 The Zoning & Annexation committee of Sylvania City Council is responsible for legislative action relating to zoning and land use planning within the city limits. At the request of council, it conducts hearings on applications for special use permits or exemptions from zoning laws. It is also responsible for developing zoning regulations for subdivisions. The following council members are on the Zoning & Annexation committee: Katie Cappellini, Doug Haynam (chair), Mark Luetke and Sandy Husman.